Teachers should learn from this meme. 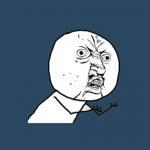 Y U NO; TAKE A BREAK FROM GIVING HOMEWORK?!? !